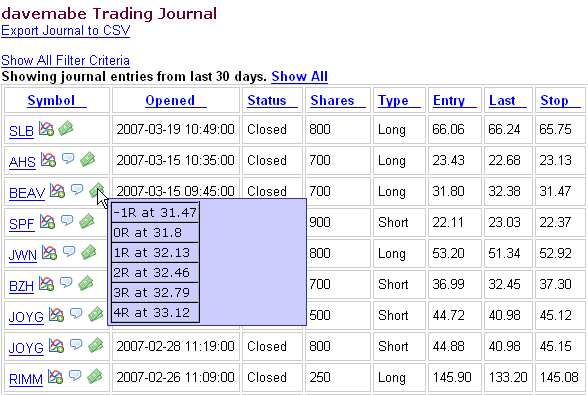 A few subscribers have already noticed, but I added some “R tables” to each entry in your StockTickr Journal. The reason I added them is because I use R values as a guide for moving my stop. For example, when I reach 1R of profit in a trade, I’ll move my stop to breakeven. As my trade reaches 2R, I’ll usually move my stop again. How far I’ll move it depends on a few factors, but these whole number R thresholds are where I make my decisions. I used to compute these numbers in my head and write them down on a sticky note when it looked like my trade was approaching 1R. The math is not hard, but I don’t like doing even simple things that could be more easily done by a computer. This is why I added the tables to the StockTickr Journal. Now, I enter my trade into the journal as soon as I make it and this R table is immediately available without my human error factor. Just hover your mouse over the green dollar icon in the journal next to the ticker symbol to see the R table.